I’m working on an update to the Practices and Techniques document I developed several years ago. While this has been a published document in my airline for several years, it was recently taken offline and is now a training background reference, as was the original intention of it’s development. Just one of the many subjects currently under revision is the section on Fuel Quantity Indication System (FQIS) – Totalizer vs Calculated Fuel. This comes after ongoing investigation of the fuel stratification issue (still unresolved). Totalizer Fuel is displayed on the EICAS as a straight representation of the aircraft FQIS. The FQIS uses 28/20 sensors in each main/center tank, which listen for pulses send out by an ultrasonic transmitter/receiver. Based on this the FQIS calculates fuel height in the tank and therefore fuel volume, and this volume in combination with the output of mass densitometers, calculates fuel on board. This system is certified based on a maximum error rate of 1% (steady, un-accelerated flight/ground) – which therefore implies a maximum error of 1470 Kg on stand with full tanks. It would be reasonable to expect the FQIS to be more accurate than this certification figure under normal conditions. Calculated fuel (which is the default value the FMC uses for fuel prediction) is based on Totalizer when the first Fuel Control Switch is selected to RUN – from this point forwards the calculated total (on a per engine basis) is reduced by measured fuel flow through the Fuel Control Units. 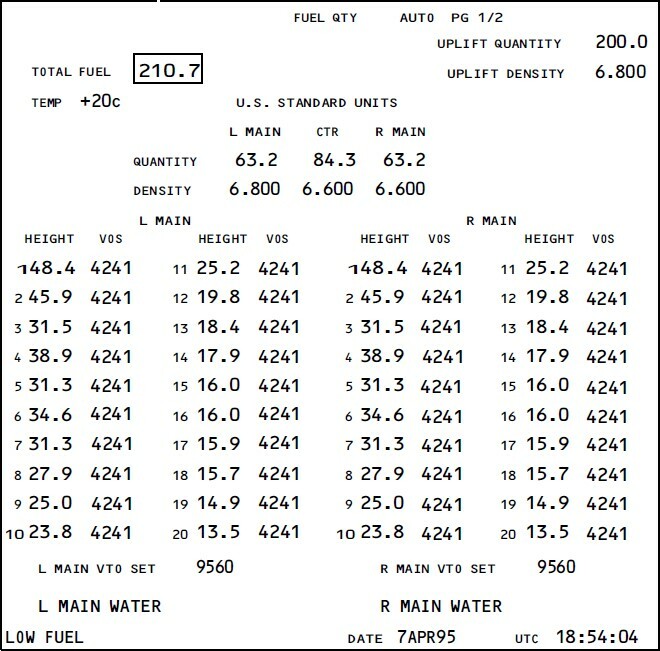 While APU fuel burn is not accounted for, the FMC calculation is generally consider more accurate, with an error rate of no more than 12% (of fuel flow); and a maximum of 0.5% at cruise. Note that the initial accuracy of Calculated Fuel at Fuel Control RUN is wholly dependent on the accuracy of the initial Totalizer value. Most flights are subject to some differences between Totalizer and Calculated Fuel. Significant differences (4 tons or so) generate an EICAS  FUEL DISAGREE message which may well indicate a fuel leak – but typically differences of up to 1 ton on longer flights are not that unusual. 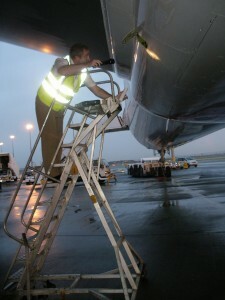 There are some indications that a combination of aircraft pre-fuelling and high ambient temperatures can exacerbate this issue through the impact of fuel stratification on the accuracy of the on stand Totalizer figure, generating an error that could then be carried into the Calculated value – but as yet these are not proven factors. From the design of the systems – the Totalizer is intended to convey the fuel remaining on board the aircraft, and should be more and more accurate as the flight proceeds, reaching its highest levels of accuracy as you run out of fuel. Meanwhile the Calculated value while initially impacted by any inaccuracies in the Totalizer figure at Fuel Control Switches Run – from this point on the Calculated value should be highly accurate. 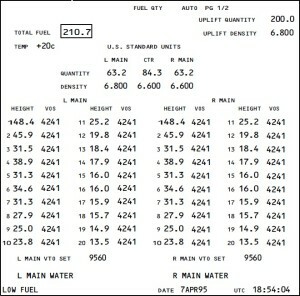 Since the Totalizer measures a large value for most of the flight (fuel on board) while the Calculated measures a much smaller value (fuel flow through the FCU nozzles); and the Totalizer is subject to acceleration and turning errors (despite the baffles in the tank) – generally Calculated Fuel from the FMC is a more accurate reflection of fuel state. Running a dual column on the OFP of both Calculated and Totalizer tends to bear this out with the Calculated Fuel indicating a general trend with variations that reflect level/speed/wind changes, whereas the Totalizer fuel track can show variations that are difficult to explain. Large discrepancies (>1500 Kg?) typically only develop in association with large fuel loads and long/ultra long haul flights. Often larger discrepancies earlier in the flight resolve themselves towards the end. The best way to resolve this situation tends to be reliance on accurately completed OFP to examine the ZFW adjusted fuel burn as compared with the fuel burn progress of the flight. This includes provision for undesirable flight levels and off route diversions of weather or other reasons. The logging of Calculated and Totalizer fuel may be desirable where discrepancies are anticipated. The difference between Calculated and Totalizer (viewed on CDU Progress Page 2) is worth considering as part of your Arrival Briefing. Some pilots focus exclusively on FMC predictions when considering low fuel operations into destination. Differences between the Calculated (FMC) and Totalizer fuel can make the operation less conservative – resulting in either an unintended commitment to destination, or an early diversion to alternate. As previously stated – at smaller and smaller values of fuel on board the Totalizer should be more accurate. While not a recommended technique, if the crew determine that the Calculated is in error, the option is available in the FMC to Totalizer instead of Calculated on PROG P2. This should only be considered if the Calculated value is considered to be in error.